Philippines and U.S. officials link arms during the opening ceremony of the 2016 Balikatan military exercises at the Armed Forces of the Philippines (AFP) headquarters in Camp Aguinaldo, Quezon city, metro Manila April 4, 2016. This year’s joint military exercises between the Philippines and the United States are underway with Japan’s Self-Defense forces observing for the first time and scores of Australian troops taking part in some special operations activities. While the Philippines’ regional partners, which have been vocal about China’s activities in the South China Sea, are playing a more noticeable role, officials have emphasized the exercises are not aimed at any one country. Philippine exercise director, Vice Admiral Alexander Lopez, reiterated that message to reporters after the opening ceremony. “But this is not. This is not. Please believe us. This is actually our purpose in coming up with this capability. The Philippines is the least capable armed forces in the region and the U.S. being a big brother is a big help here,” he said. Lopez said Manila welcomed training with the Americans’ advanced technology. U.S. Marine Lieutenant General John Toolan, who is heading U.S. forces for the drills, said Washington wants to see stability in the region, including averting a crisis in the South China Sea. He said understanding what’s going on in the sea is a critical aspect of the drills. FILE - US marines prepare to board buses outside their temporary base on their way to a nearby air base as the annual US-Philippine joint military exercise winds down at the former US target range in Crow Valley, Capas town, north of Manila on May 15, 2014. Officials from both countries said they also want to strengthen humanitarian and disaster response. 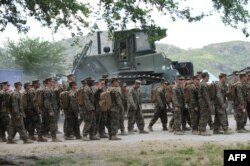 The Philippine military said about 8,500 U.S. and Philippine troops are taking part in the exercises called Balikatan, or “shoulder to shoulder.” Officials added that between 80-95 Australian troops would also participate in a special operations exercise for the first time, with eight Japanese self-defense officers observing. Philippine assistant exercise director Major General Rodolfo Santiago said the special operations drills with Australia joining in would involve safeguarding an oil rig.He did not specify in which waters, but he confirmed they would not be in the country’s only natural gas operation in waters off the South China Sea. The Philippines, Brunei, Malaysia, Taiwan and Vietnam have overlapping claims in the resource-rich, heavily traversed sea. China has said it has “indisputable sovereignty” over practically the entire sea. Over the past two years, it has built-out formations on artificial islands capable of docking large vessels and landing military craft. In 2013, the Philippines filed a case with an international tribunal questioning the legality of what it calls China’s “excessive claims” in the sea. China rejects arbitration and is not participating in the case. A decision is expected in the next few months. Japan does not have any claims in the South China Sea, but it has its own dispute with China over a chain of islands in the East China Sea and it continues to fly in airspace China has deemed an Air Defense Identification Zone. In recent months, Australia has been vocal about supporting the arbitration case as well as freedom of navigation excursions into disputed areas, with defense officials saying there has been an uptick in radioed warnings from China to its military craft flying over disputed formations. 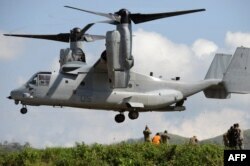 FILE - A US Air Force V-22 Osprey prepares to land near the command post prior to live fire drills on the last day of the annual US-Philippine joint military exercise at the former US traget range in Crow Valley, Capas town, north of Manila on May 15, 2014. Geopolitical analyst Richard Heydarian of De LaSalle University in Manila said the more visible involvement of other major powers is in anticipation of the arbitral tribunal’s decision. Analysts anticipate a partial ruling in favor of the Philippines, and Heydarian said enforcement of the binding decision would fall on those who could best monitor the disputed sea. Officials said a high-mobility artillery rocket capable of firing surface to air or surface to surface munitions would be tested during the drills, with U.S. Defense Secretary Ashton Carter expected to watch during a visit to the Philippines next week. The joint exercises will end on April 15.